Vegetables appear on our local Chinese restaurant menus in various guises described as "Monks Vegetables" or just plain "Mixed Vegetables". 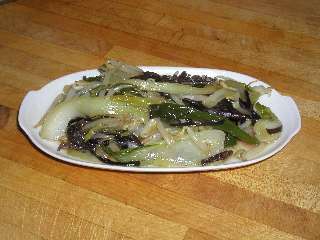 How ever that are described, they are usually just a stir fried mixture of fresh vegetables with a very light sauce. What ever they are, the secrets in preparation are never over-cook, use only fresh, add the ingredients in the right order according to cooking time and serve quickly. This recipe is both vegetarian and very low calorie and suitable as a main dish as part of a weight loss diet provided that you do not accompany with too much rice. Note, though, that there is very little protein in a portion. We also tend to minimise the amount of salt used and add a little more soy sauce at the table if required. Serve with plain boiled rice as a main dish allowing 160g for two people or as a side dish to a full Chinese meal. This whole dish can be prepared and cooked in 30 minutes or less. 50 - 60g (2 - 3oz) medium sized spring onions, wash, trim and cut in half length wise then into 5cm (2") lengths. 25g (1oz) shredded Chinese dried black fungus (mushroom). Thinly sliced fresh mushrooms or other dried types can be used. Optionally 1 finely chopped green or red chilli, de-seed if you want the flavour without excess heat. Omit if you do not like your food hot. 2 tablespoons (30ml) dry cooking sherry or rice wine. 1 tablespoon (15ml) vegetable oil mixed with 1 tablespoon (15ml) of sesame or peanut oil. 2 tablespoons of plain oil can be used if necessary. You will also need a Wok or a large, deep non-stick frying pan or saute pan. Soak the dried fungus in enough fairly warm water in a bowl for 20 minutes, drain and keep the liquid. Use water enough to cover thoroughly. Prepare all the vegetable ingredients. Mix the soy sauce, sherry and corn flour together in a dish, stirring until you have a smooth liquid. Add 2 tablespoons of the reserved fungus liquid to the soy sauce mix and stir again. Heat the oil in the pan until quite hot, add the chopped ginger, it should sizzle. If it does not sizzle, keep heating until it does. Add the spring chilli if used and then the spring onions, stir and fry for 20 seconds or so. Add the Pak Choi, stir, add the chinese leaves, stir for 30 seconds. Add the soaked fungus or mushrooms. Stir for 30 seconds and then add the soy sauce mix, sugar and salt. Continue to stir and fry over a high heat for at 2 minutes or until the vegetables appear to be cooked. They should be crisp but cooked. Add a little of the reserved mushroom liquid if there is any sign of sticking. The total cooking time should normally be less than 5 minutes. Turn out into a warm serving dish or serve immediately, if you leave the mixture in the pan for too long the vegetables will over-cook. If serving with rice, start cooking the rice before you start the stir fry. If you have any comments or suggestions, please use our contact form - good eating!